Canadian Railroads operate a vast network of rail lines across Canada and into the United States. 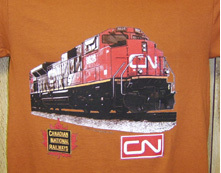 One of the Canadian National Railways newest widebody diesel electric locomotives on a beautiful Texas Brunt Orange tee. Includes logos of today and yesterday. 6 inch x 6 inch square tin logo sign of the Canadian National Railway. One of the Canadian National Railways newest widebody diesel electric locomotives on a white 11 oz coffee mug. Old and new logos on back side of mug. 6 inch x 6 inch square tin Beaver logo sign of the Canadian Pacific Railroad. 6 inch x 6 inch square tin sign of a logo used by the Canadian Pacific Railway in the 1800s. 6 inch x 6 inch square tin sign of their famous Beaver with Steam engine logo used by the Canadian Pacific Railroad in the 1940s. A rarely seen logo. 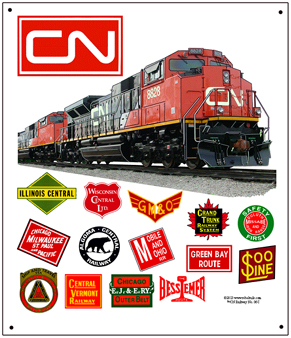 Tin sign featuring heritage logos of railroads that make up the Canadian National Railway. Canadian Pacific sign of a station stop at historic Banff Lake. 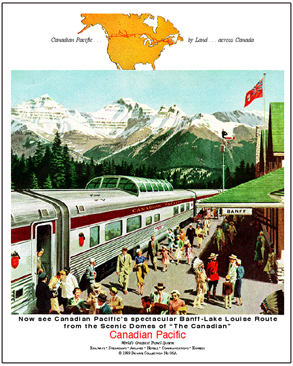 Canadian Pacific sign of the transcontinental Canadian.